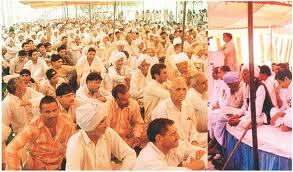 Jat Vote bank is one of crucial node for Congress-RLD alliance in UP Assembly Election 2012 along with Muslim votes. Even though the Jats, who form RLD's core constituency, comprise just 2.6% of the electorate in UP, they are present in significant numbers in the 15 districts that go on to constitute western UP. Being the dominant caste of the region, they have over the decades played a crucial role in shaping its polity. In the post-Mandal-Masjid era, barring a short period in which they had switched their allegiance to BJP, the Jats have remained by and large loyal to RLD. Former prime minister Charan Singh, Union civil aviation minister Ajit Singh's father, is still revered by them. Jats add up to around 6% of the vote-base in western UP, but have the potential to swing the electoral outcome in quite a few assembly seats in the districts of Bijnor, Jyotiba Phule Nagar, Muzaffarnagar, Meerut, Baghpat, Ghaziabad, Gautam Buddh Nagar, Mathura, Agra and Aligarh. In 2007 assembly polls, RLD won 10 assembly seats, securing 5.76% votes in the seats that it contested. But lets wait and watch whether Jat takes U Turn from RLD-Congress after being betrayed by offering Sub quota to Muslims/Minorities from OBC Quata by Congress led UPA Government in Central/PSU Jobs just before UP Polls which makes Jat Community a real looser in term of reservation.